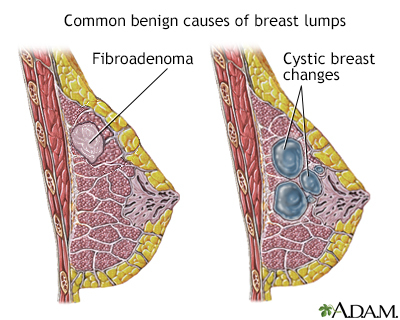 Most breast lumps are benign (non-cancerous), as in fibroadenoma, a condition that mostly affects women under age 30. Fibrocystic breast changes occur in more than 60% of all women. Fibrocystic breast cysts change in size with the menstrual cycle, whereas a lump from fibroadenoma does not. While most breast lumps are benign, it is important to identify those that are not. See your health care provider if a lump is new, persistent, growing, hard, immobile, or causing skin deformities.